Comment: The stone and brick steps and walkway to the house have deteriorated. Although the work is fairly new, it was not sealed properly and after our hard winter, has started to deteriorate. There are cracks forming in the mortar, pieces of brick are falling out and some of the cement has broken. 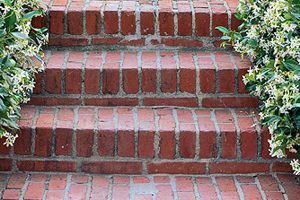 The steps and patio need to have the mortar replaced, a few bricks replaced, and sealed before the winter. Comment: This job entails repairing the main entrance way staircase. Currently there are 9 steps and a landing at the 4th step. Currently, the stair treads as well as flagging on the landing are made of stamped concrete. which is badly deteriorated and loose. this job entails removing and replacing 9 concrete stair treads and concrete flagging with stone natural stone treads and flagging. Comment: Create a retaining wall @36' long & 2-4' high at side of house (widening existing access). Comment: The front steps need a little cleaning up and the back stone wall needs some new mortar, as stones are loose. It is not a major job, but it needs to be done. Comment: Steps to front of house have deteriorating mortar on three steps. Comment: Repair mortar on stone wall and steps. They need caulking. Comment: installed central air. Now need to have 2 window a/c units removed from wall. One in masterbed and other in guest room.There is some brick work that needs to be installed. Bedford Hills Brick & Stone Masonry Contractors are rated 4.80 out of 5 based on 736 reviews of 45 pros. Not Looking for Brick & Stone Contractors in Bedford Hills, NY?